Kundalini Yoga (koon·dah·lee·nee) is probably known to many people as the most unique form of yoga. In all yoga practices we are looking to generate and enhance our prana, our life-force or energy for everyday living. This energy flows through the nadi system of the energetic body, which is very much like the circulatory system of our physical bodies. Kundalini Yoga practice is meant to awaken and strengthen the kundalini energy residing at the base of the spine. This energy is said to be coiled at the base of the spine like a snake and is aligned with the 7 chakras of the spine. Kundalini is based within our own divinity. When the energy is tapped into and released, it moves through the spine upward into the Universe and downward into the Earth, allowing us to be completely connected to the Great Divine. The practice of Kundalini utilizes what are called kriyas, which are exercises done repeatedly to activate energetic systems within the body, to help us break through emotional and physical barriers and to allow us to connect deeply to our greatest Self. They are meant challenge us, but not to bring us pain or severe discomfort. So, if you begin practicing any of the kriyas in this sequence and find that you have difficulty breathing, bodily pain or something just doesn’t ‘feel right’, please take some time to rest either sitting in Easy Pose or Child’s Pose until you’re ready to move on. Consider taking a few moments to center yourself with some deep breathing and calming meditation practice to prepare for your Kundalini Yoga practice. Sitting on the floor with your legs stretched a wide, comfortable distance apart, ground down through the ischial tuberosity (I.T., aka sitz bones) and drop back slightly into the tail bone. From here, inhale and extend both arms up overhead. As you exhale, turn your torso towards your right leg and fold forward from the hips with a straight spine, careful not to hunch or round too much. Inhale and extend the arms upward again and as you exhale, turn your torso towards the left leg and fold down over the leg. Repeat, alternating sides for 3-5 minutes. This exercise is deeply relaxing and promotes glandular secretions to circulate throughout the body. Come back to Easy Pose with legs crossed and bring your pointer finger to touch your thumb on each hand in guyan mudra . Sit quietly with your breath for a few moments before moving on the next kriya. Sitting in a comfortable cross-legged position with your hands on your knees, begin circling the upper body in a clockwise direction. Make small circles to begin and slowly work your way to wider circles. To connect your movement with your breath, inhale as you round forward and exhale as you round back. Allow your head and shoulders to relax and find a comfortable rhythm with your breath. This movement is very soothing – you’ll feel yourself becoming one with everything that makes an orbital movement, from the planets to the cells in your body. Allow yourself to feel a connection to the space you are in and enjoy the feelings associated with this practice. Continue for 1.5-3 minutes before starting to slowly bring your circles closer to the center mid-line of the body, making smaller and smaller movements until you stop completely. Sit up tall and take a deep breath in and out. Repeat movement in a counter-clockwise direction for another 1.5-3 minutes. Finish in Easy Pose. Again, bring your pointer finger to touch your thumb on each hand in guyan mudra and rest quietly with your breath. Notice any changes that have occurred within you before moving on. Continue to sit in Easy Pose, but take a look at your crossed legs. One of your legs should either be in front of or on top of the other. Switch your legs into opposite positions so that the one on the top or the front moves to the bottom or the back. This will feel a little “weird” as you probably are accustomed to sitting the other way regularly. Place your hands on your knees. From here, inhale and extend your chin and chest forward and pull your shoulder blades down the back. As you exhale, round the shoulders and the spine, drawing in the navel and dropping your chin down towards your chest. Continue to flow with your breath for 3-5 minutes before finishing by sitting quietly for a few moments with hands in guyan mudra. Come to your back. 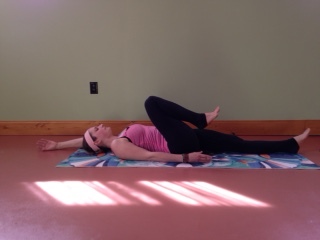 Inhale slowly as you pull the low belly in and lift your left leg to 90 degrees, toes pointed toward the ceiling. Exhale slowly as you lower it down. Place your palms face down under your hips if you need extra support for your lower back. Alternate left and right legs for a total of 10-20 times on each leg. This pose begins to spark energy at the navel point. When you’re finished, draw your knees into the chest and rock on your back from side-to-side, allowing your head and shoulders to relax to the floor. Place your feet just a little wider than hips-distance apart with the heels turned in and toes turned out on an angle. Keep your knees softly bent and soften all the other joints in your body. Begin to gently twist from side to side so your arms are floppy. Allow your arms to “slap” against your front and back as you twist. This helps to detoxify the kidneys. Breathe deeply. Repeat at least 20 times. Take a deep squat with your heels in and your toes pointed out, legs splayed out to the sides like a frog. With your eyes closed, place your hands on the ground and focus your attention on the third eye, rolling your eyes up to look between your eyebrows. Breathe out and straighten your legs, raising your buttocks, hands remaining on the ground. Your heels can be on or off the ground. Breathe in, and return to the squat. Repeat at least seven times, building up to 26 times. Place your palms together at heart-center and your elbows on the inside of your knees and remain in malasana (garland pose) for 3-5 breaths. Sit on a block or two stacked blocks if this pose is too challenging for you. You can build up speed as you get used to the position. You’ll really sweat when you’re doing this pose. But afterwards you’ll feel that your head is clear and you can let go, you can get on with life. Bring your feet shoulder-width apart. Let go of any tension in your shoulders and arms. Keep your knees soft. Jump up and down while shaking out your arms like you are flinging water off of your arms and hands. Do this for 1 to 5 minutes. A good way to keep your momentum going is to choose a song with a good beat and jump for the duration. Let out a yell every now and then to keep yourself going. When you finish jumping, take five deep inhales through the nose and exhales through the mouth, like you’re trying to fog up a mirror. For a lower impact variation of this practice, jump from one foot to the other, almost like skipping in place. Come to the floor on your back. Lie down with your legs out in front of you and your arms by your sides. Inhale and bend your left knee into your chest as you bring your right arm up over your head. Exhale and straighten your left knee, lowering the leg and right arm back to the floor. Switch sides and continue to alternate, using long, deep breaths, for 3 minutes. Concentrating your awareness at your navel point helps to build energy around your third chakra, the Solar Plexis. Hold for 2 minutes while doing Breath of Fire: First inhale by relaxing the upper abdominal muscles, allowing air to fill the lungs. Then exhale by quickly drawing the navel point and solar plexus in and up toward the spine as you force the breath out. Take even inhales and exhales and build to 2 to 3 cycles per second. (Do not do Breath of Fire if you are pregnant or menstruating.) 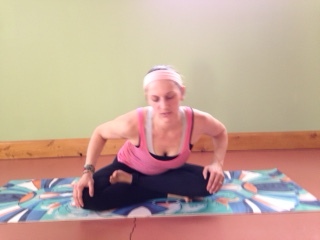 Stretch Pose with Breath of Fire can be calming and rejuvenating. By working on the third chakra, it boosts resolve and self-esteem. Staying on your back, extend arms and legs straight up to the sky and shimmy them. Wiggle and jiggle your fingers, hands, arms, feet, and legs. Shake it all out. Here is the best part: Scream at the top of your lungs like you are having a temper tantrum while you are shimmying and shaking. Do this for 1 to 7 minutes. Hug your knees into your chest and rock on your back gently from side to side for a few breaths. Come to hands and knees in a table-top position. 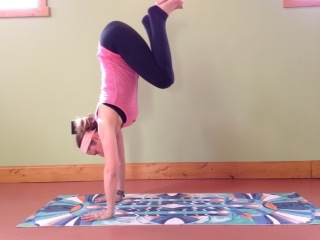 Tuck your toes and lift your hips into Adho Mukha Svanasana (Downward-Facing Dog). Step your feet in a little closer to your hands than usual. Bend both knees and hop both feet off of the floor, kicking your heels to your bottom. Repeat for 1 to 5 minutes. Again, a song with a good beat and a little yelling will help to keep you going. For a lower impact variation, kick only one foot up at a time, like you’re kicking yourself in the bum. If donkey-kicks just aren’t for you, try this variation of down dog instead. Come into this variation of Downward-Facing Dog Pose by bringing your thumbs together so they are touching and fingers angled slightly out (place your hands shoulder-distance apart if you have a shoulder injury). Keep your feet hip-distance apart and step your feet about a full step or so closer to your hands than you normally would in this pose. Engage the core to draw the hips up and back and lift weight out of the shoulders. Take long, deep breaths for 1-3 minutes. 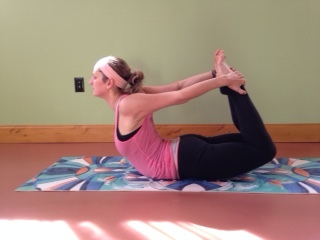 This pose, essentially an inversion, allows energy to flow toward the brain. Press back into Child’s Pose (Balasana) with your knees together or spread apart, depending on which you prefer. Bring your hips back onto your heels, and your forehead onto the ground. Extend and rest your arms in front of you with hands shoulder-distance apart. Relax here for 1-3 minutes, returning to a natural rhythm with your breath. 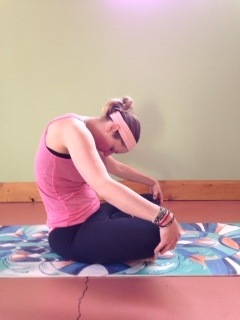 Optional variation: Bring your arms alongside your body, palms facing up beside your feet. Relax here for 1-3 minutes, letting your breath return to normal. Come to lying on your belly. Place your hands under your shoulders, fingers spread wide; grounding down through your pelvis and the tops of your feet, firm your legs and reach your tailbone toward your heels. Inhale and lift the chest, keeping a slight bend in the elbows, the chest open, and the shoulders relaxed. Exhale and release your head and chest back down to the floor. Repeat 7-26 times, ending in cobra pose for 3-5 breaths. 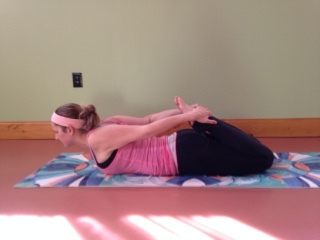 This pose draws energy toward the spine and opens the chest. Remaining on your belly, bend both knees and reach hands back to hold on to your feet, ankles or calves. Extend your chin forward and keep your knees close together. As you inhale, lift your chest and both knees as high as you can off of the floor. Exhale and slowly release back down. Repeat for 7-26 breaths. 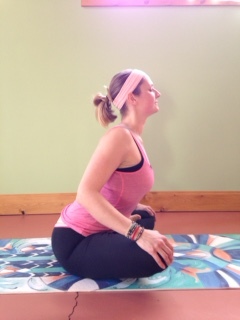 Finish in full upward bow pose for 3-5 breaths. This pose lifts the energy we have been cultivating toward the heart center, allowing a feeling of expansion and brightness. 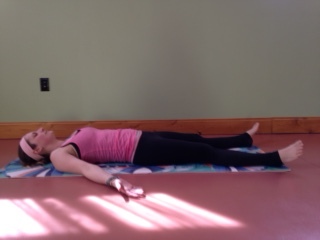 Lie on your back with your legs extended in front of you for Savasana, or deep relaxation. Let your palms turn up and your arms and legs relax. 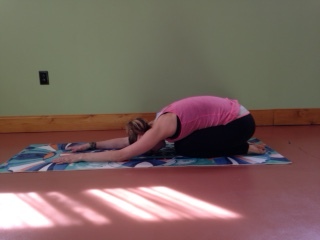 This pose allows you to fully integrate the energy of the practice and reset the nervous system. Take a few deep breaths to surrender down into the space, letting your body get heavy. Use your awareness to relax all the muscles in your body. Stay here for 5 to 7 minutes.